From engineering to architectural, firms have joined the national movement and embraced flexible working arrangements. Growing number of A/E firms are opting to be flexible when it comes to where and how employees work, according to PSMJ Senior Principal Dave Burstein, P.E. Meanwhile, PSMJ's 2017 A/E Bonus & Benefits Benchmark Survey has found that in fact increasing numbers of A/E firms offer both flextime and telecommuting. Flextime Policies and Benefits. A flextime policy permits employees to set their own individual schedules for starting and stopping work. Most flextime policies establish requirements that employees work a defined numbers of hours per week (e.g., 40 hours). Typically, firms also require that all employees are in their office during a specified time period, for example between 10 a.m. and 3 p.m. Employees are permitted to begin any time before 10 a.m. and leave any time after 3 p.m., as long as they meet their total workday or workweek time requirements. Flextime tends to be extremely popular with most employees and is considered to be important as an employee benefit. It is especially critical to young professionals who need flexible work scheduling for child care, etc. Per PSMJ's 2017 A/E Bonus & Benefits Benchmark Survey, three-quarters of firms (77%) have authorized flextime for their employees, an increase from 67% reported in the 2015 edition. Moreover, flex time is a popular choice among many types of firms. More than three-quarters (77%) of firms have a policy that permits telecommuting. This percentage has increased significantly over the past 12 years, reaching an all-time high this year. It appears engineering firms are more likely than architectural firms to allow their employees to telecommute. 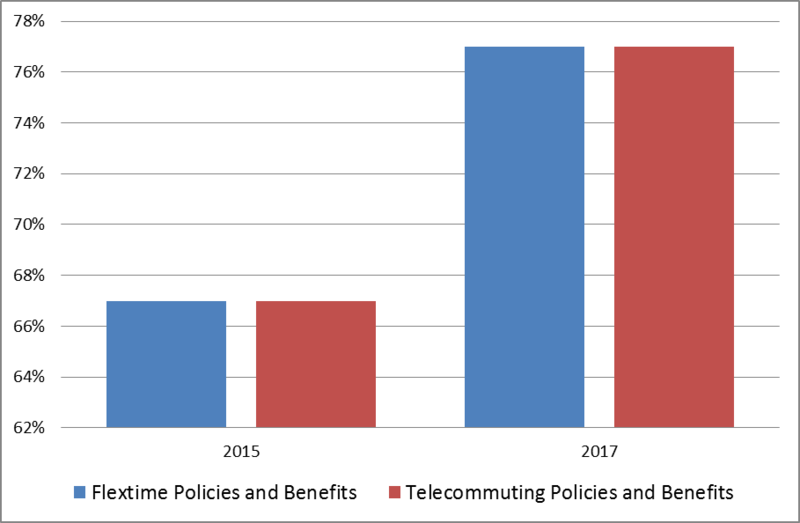 Firms that have telecommuting policies in effect report that only 50% have employees actually using this policy; however, this percentage has increased significantly in comparison to the 2011 survey report (34%). It is far more likely for firms with more than 50 employees to report that some current employees are performing work from remote sites. Now more than ever, architecture and engineering firms need to work hard to keep their best talent by offering a bonus and benefits program that just doesn’t keep up with today’s standards. 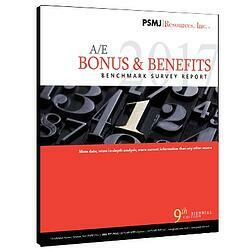 Pre-order your copy of PSMJ’s 2017 A/E Bonus & Benefits Benchmark Survey. This report is so much more than a few data points on performance bonuses and health insurance. It digs deep into exactly when, where, and how the A/E industry’s top performers are delivering on the promise to keep their top performers engaged and productive.